The Prophaethontidae occur in late Paleocene to middle Eocene marine localities of Europe, Asia, North Africa, and eastern North America. The taxon was originally established for Prophaethon shrubsolei Andrews, 1899 from the early Eocene London Clay of the Isle of Sheppey. The holotype of this species is a partial skeleton including a nearly complete skull (Fig. 7.10), a pelvis, as well as pectoral girdle and hindlimb elements (Andrews 1899; Harrison and Walker 1976c). Olson (1981) noted that a humerus fragment from the Isle of Sheppey, which was described as the putative ibis Proplegadis fisheri by Harrison and Walker (1971), more closely resembles the Phaethontidae; the bone is, however, too small to be from P. shrubsolei (own observation). Virtual endocasts of the skull of P. shrubsolei were examined by Milner and Walsh (2009). A second species of the Prophaethontidae, Lithoptila abdounensis, was reported by Bourdon et al. (2005) from late Paleocene and early Eocene strata of the Ouled Abdoun Basin in Morocco. Its original description was based on a well-preserved cranium, but abundant postcranial remains from the same locality, which were originally identified as bones of charadriiform birds (Bourdon 2006), belong to the same species (Bourdon et al. 2008b). Bourdon et al. 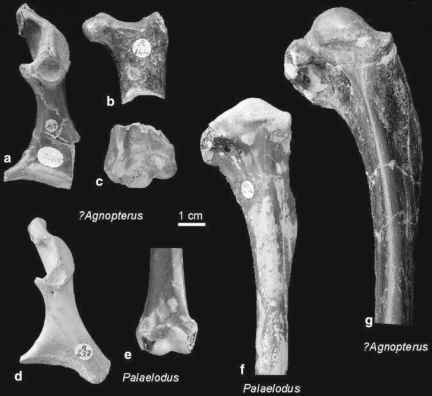 (2008b) further showed that the humerus of Lithoptila is very similar to that of Zhylgaia aestiflua Nessov, 1988 from the late Paleocene of Kazakhstan. Accordingly, this species, which was originally also assigned to the Charadriiformes (Nessov 1988, 1992), was classified into the Prophaethontidae by Bourdon et al. (2008b). L. abdounensis is of size similar to P. shrubsolei and Z. aestiflua, and had a wingspan of about 1 m (Bourdon et al. 2008b). A distal end of a humerus and an incomplete coracoid from the Paleocene of Maryland (USA) were assigned to the Prophaethontidae by Olson (1994), and a coracoid of a prophaethontid bird was reported from the middle Eocene of Belgium by Mayr and Smith (2002b). Prophaethon shares with extant Phaethontidae and other representatives of the nonmonophyletic "Pelecaniformes" a derived articulation facet for the furcula on the sternal carina, and a distinct nasofrontal hinge. A sister group relationship between the Prophaethontidae and Phaethontidae resulted from a cladistic analysis by Bourdon et al. (2005) and, among others, is supported by a very large dorsal tympanic recess. 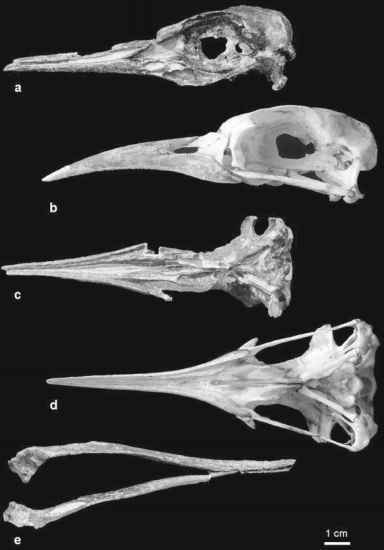 The skull of Prophaethon is similar to that of living tropicbirds, but differs in the presence of long and slit-like narial openings (Fig. 7.10). In contrast to that of extant Phaethontidae, the pelvis of Prophaethon is much more elongated and narrower, and the tibiotarsus bears strongly projecting cnemial crests. The tarsometatarsus of Prophaethon is unknown, but that of Lithoptila differs from the corresponding bone of extant Phaethontidae in being proportionally longer and less dorsoventrally flattened. Bourdon et al. (2008b) assumed that the long-winged prophaethontids were offshore or pelagic feeders. The features of the pelvis and tibiotarsus indicate that these birds had better diving and swimming capabilities than extant Phaethontidae (Andrews 1899). Bourdon et al. (2008a) tentatively assigned a proximal humerus from the early Eocene of the Ouled Abdoun Basin in Morocco to the Phaethontidae. The specimen was assigned to a new species, Phaethusavis pelagicus, but its actual distinctness from the Prophaethontidae still needs to be verified by additional material.